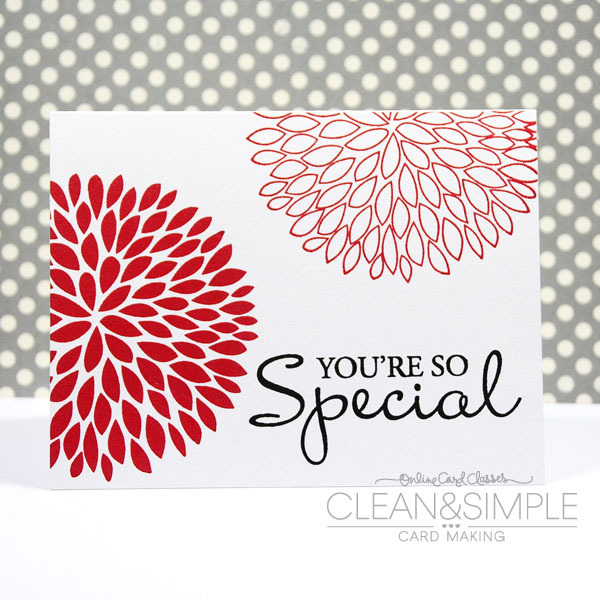 Soni is also taking the Clean & Simple Card Making Class with me and she was inspired by the following card made by Julie Ebersole. Julie used the large solid flower and the large open flower stamps, both by Hero Arts. Soni didn't have the large flowers, so she used the smaller version of the same images. Since the images were smaller, she ended up with more white space. To cut down on that white space, Soni decided to make some layers. She ended up with these two fabulous versions! On this one, she used buttons for the centers of the flowers and cut the upper flower with a Spellbinders scalloped circle nestie. Pretty punched hearts were used for the centers of these flowers. In addition, all of the images, on both of Soni's cards, were heat embossed to make them bolder and therefore, stand out more. Stay tuned for more cards to come! I'll have a butterfly card for you tomorrow!